Visualising your digestive system as a river may not seem the most obvious way of treating an illness. But that is exactly how hypnotherapists at a unique centre in Withington Hospital, Manchester, have been helping people with Irritable Bowel Syndrome (IBS). The condition can leave people in constant discomfort and can cause severe pain. And it can prevent them from working or socialising normally. 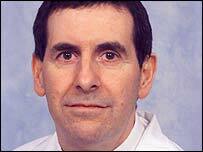 Dr Peter Whorwell, the gastroenterologist who founded the centre, devised the "river" concept. The aim is to make the river flow smoothly. If there is a blockage or a flood, they are asked to visualise a way the problem can be solved. 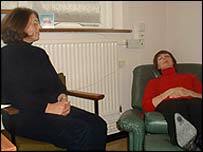 Sessions with a therapist, interspersed with home practice using a CD, are aimed at "retraining" a patient's gut and eradicating their problems. Since IBS affects everyone differently, the therapy is tailored to each patient. So someone with constipation may visualise rocks which are blocking the river and have to be removed, while someone with diarrhoea may want to shore up the banks to prevent the river running so swiftly. The therapy has proved highly effective, with a recent study showing it had helped 71% of patients for up to five years after their course of treatment. Vivien Miller, one of the team of hypnotherapists at the centre, said: "We are helping people control what's going on in their bodies, and telling them they can control their symptoms." The centre is the only one of its kind in the UK and treats around 160 patients from across the country each year. IBS affects between 10 to 15% of the UK's population. Most will only have minor symptoms - but a fifth of them will suffer from faecal incontinence. Patients are referred to the centre if they are experiencing severe IBS - where their lives are constantly affected by feelings of bloating, discomfort or constipation, or diarrhoea which can strike at any time. Dr Whorwell became interested in the potential of hypnotherapy for IBS patients over 20 years ago. He kept his new interest under wraps from sceptical colleagues until research proved it was effective. "We had to stay in the closet to begin with and doctors can still be a bit sniffy about it." He stresses the hypnotherapy he and his team use is nothing like the TV or stage hypnotists who make people dance like chickens or take their clothes off. And he says it is no cure-all. "I give a lot of lectures to sceptical doctors. A lot of hypnotists take things very seriously and say they can cure anything. I don't. "But IBS is a nuisance to treat. There are no treatments that are effective, so I thought we should try hypnotherapy." He added: "People are suspicious because they have seen stage hypnotists. "But you cannot be hypnotised against your will. And you won't act out of character while you're hypnotised." Dr Whorwell is trying to spread the word to other doctors around the country. But he says many are still reluctant to use the technique. There are two theories for why hypnotherapy works for IBS. One is that by making people less anxious, it in some way makes the bowel less sensitive, thereby reducing symptoms. One study showed patients could put their hands into boiling hot water without registering pain after being hypnotised, when they had earlier experienced intense pain. The hypnotherapy reduced the amount of activity in the ACC. While many doctors may still be a little suspicious of using hypnotherapy, Dr Whorwell says patients have no such qualms. "They are falling over themselves to have the therapy, particularly the younger ones. 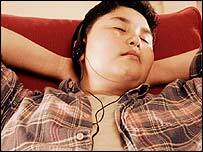 "Many are on antidepressants, because they have the effect of lessening pain sensations at low doses. "But if you're 25 and you had the option of a long-term course of antidepressants or having hypnotherapy that will put you right, which would you choose?"